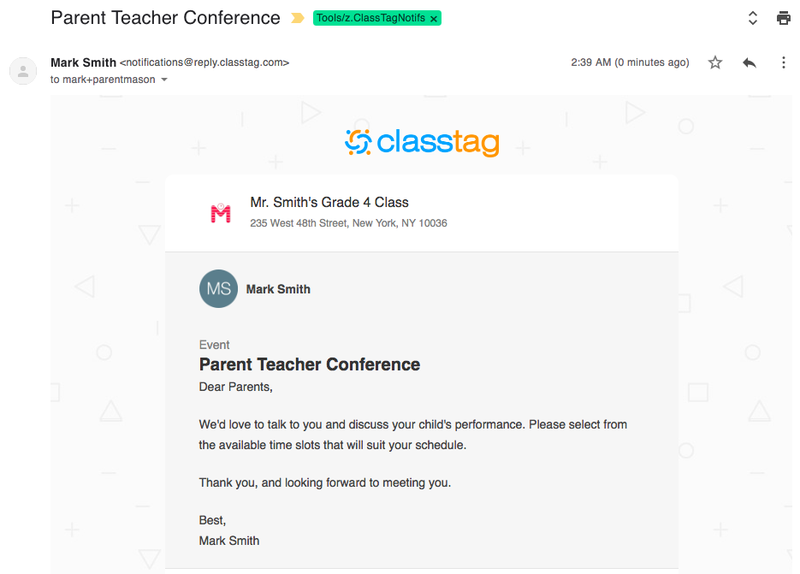 Helpful guide on how a teacher can set up and organize a Parent-Teacher Conference on ClassTag. 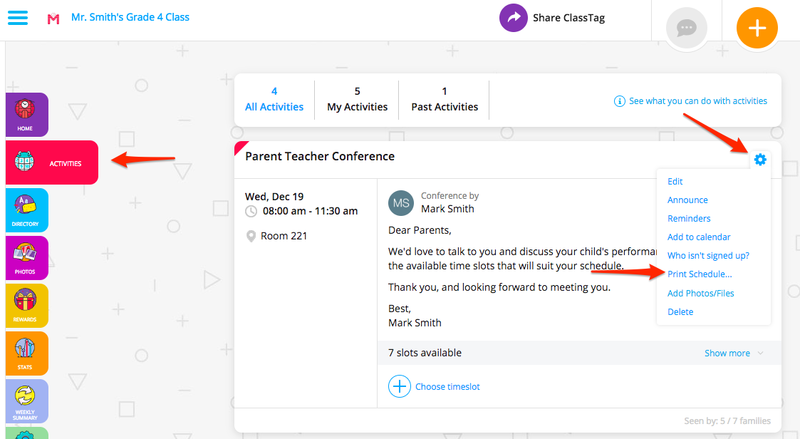 One of the features that teachers love is the ability to set up and organize a Parent-Teacher Conference on ClassTag. Here is a quick video on how to do this. Please follow these steps on how to set up your upcoming Parent-Teacher Conference. 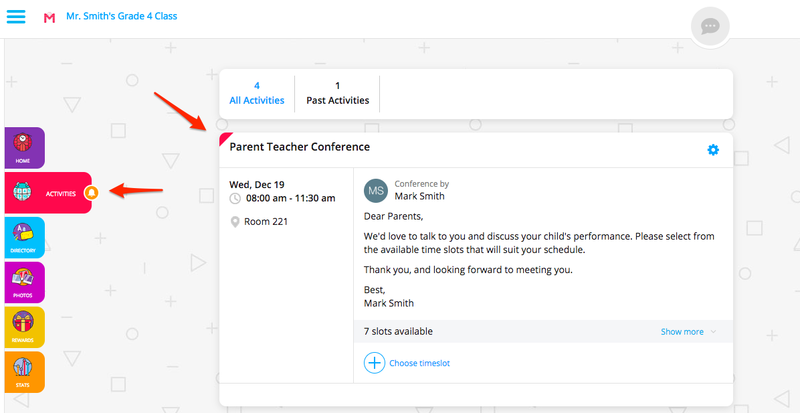 Click the “+” key on the upper right side of the page and select Parent-Teacher Conference. 3. You’ll see a calendar where you can choose a date. 4. 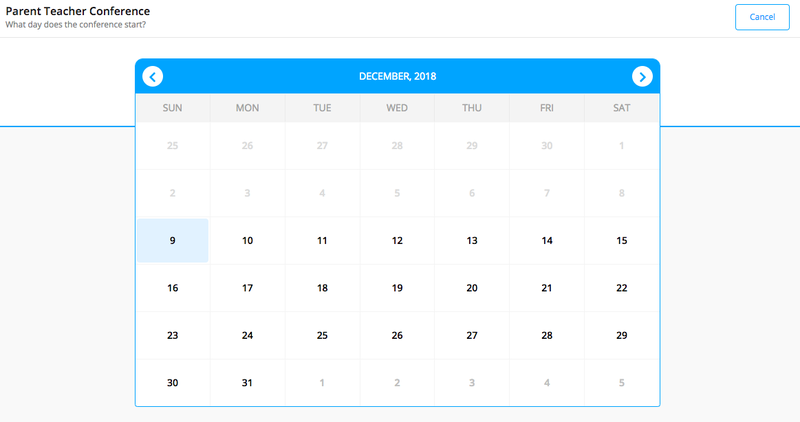 After you picked a date, pick the time and duration for the first slot and then keep clicking 'Create Timeslot' until you have the number of slots you need on that day and any of the following days in the schedule. 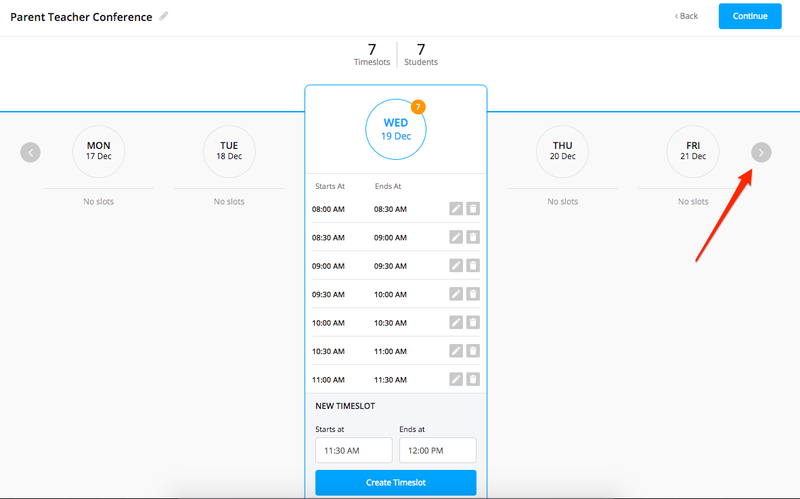 ClassTag will automatically remember the duration of the last slot you enter. The minimum number of slots you can add should be the number of students you have in your class. You can add more if needed. 5. 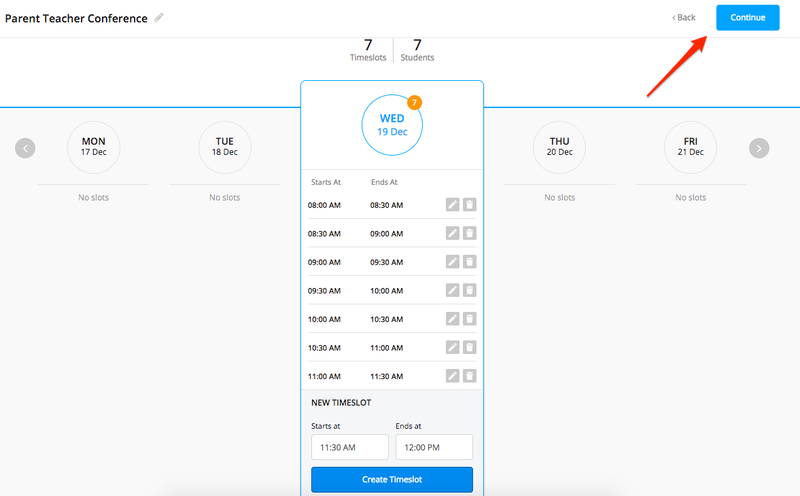 You will quickly see the total number of slots you created across days vs. number of students in your class in the middle of your screen and a count of slots for each of the days. You can keep moving across the dates by clicking on them or by scrolling with a grey arrow. 6. Click “Continue” on the upper right side of the page. 7. You can add more details of your conference on the next page. Once done, click on the “Preview” button. 8. Review the details and click “Done”. 9. 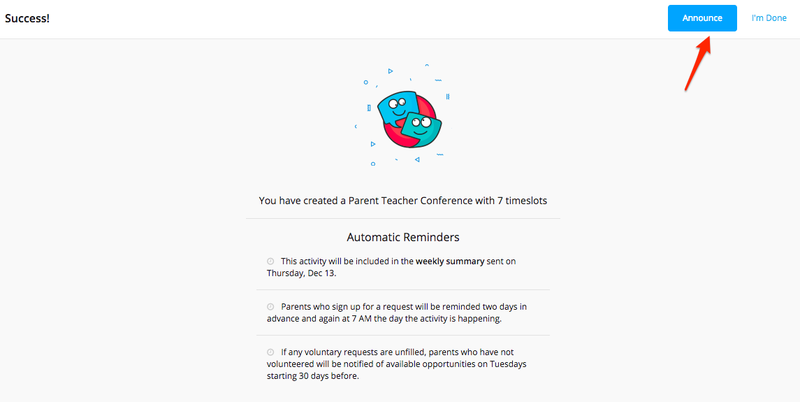 On the next page, you can either announce the conference by clicking on the “Announce” button so parents will get notifications via email or SMS or just click “I’m Done”. If you already have invited the parents, you can go ahead and announce the conference. Announcing a conference will send all invited parents an email or SMS containing your message and the details of the conference itself. Please note that your message can be very brief as the information about the event will be contained along with the announcement automatically. Here’s a sample email that the parent will receive once the conference has been announced. 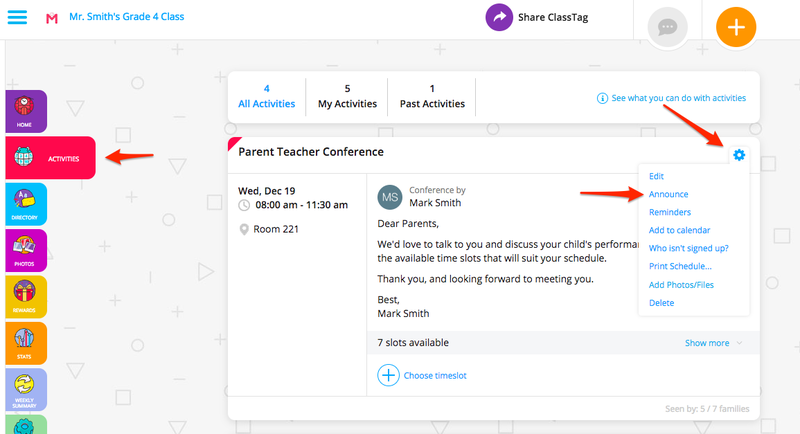 If you haven't invited the parents yet, they will not receive any notification, and they will only see the conferences on the Activities tab when they join. In this case, we recommend sending the announcement about the conferences after parents have been invited. Here's how it looks like on the parent’s side. If you haven't invited parents yet or not ready to announce it, you can do so at any time from the Activities tab by clicking on the little wheel on the right next to the name of the event. By sending the announcement from the event itself vs. general announcement with '+', the information about the event will be automatically pulled up. 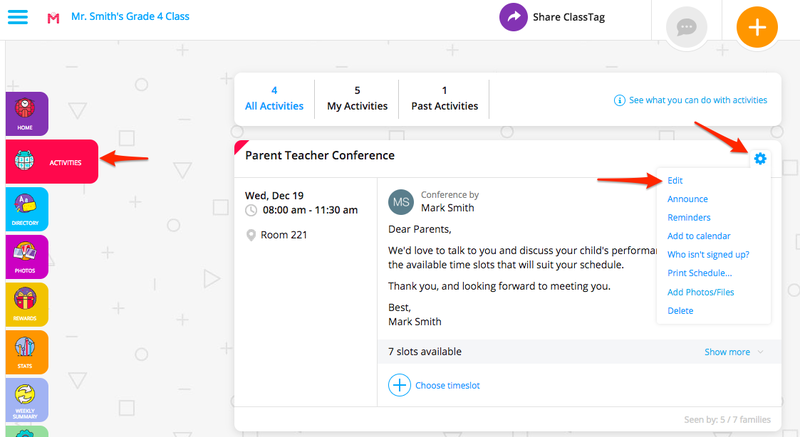 If you haven't used ClassTag before and need to invite parents to join for parent teacher conferences, you might find this article about inviting parents helpful. You can also assign parents to slots yourself if they don't have an easy internet access. Please take a look at this help article. If you need to add time slots or remove some that you don't need or change any other information, please click 'edit' from the small wheel drop-down next to your conferences in the Activities tab. You can also print the schedule and see exactly who hasn't signed up for the conferences from the drop down in the little wheel.